Yoga is about finding a better harmony – increasing the life force, and relaxing. 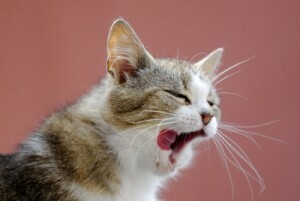 Yawning also does this – what better way to release tension through the day with a big yawn? Yawning is natures way of releasing toxins and waste products from the blood.It creates a strong downward movement of the diaphragm, draws in more fresh air and release stiffness from the trunk muscles caused by tiredness, boredom or bad posture. Start by relaxing your jaw, let your chin drop down towards your neck so your mouth is loosely open. This is the proper healing way to yawn, not the polite small yawn behind a hand. As your jaw hangs you will find yourself starting to take a really big yawn. Just let it happen, enjoy the that big cat like yawn. You will feel it in your face, eyes, head, throat, upper chest and it also affects your lower organs. Yawning is one of the best remedies for tiredness and tension. Sometimes people yawn spontaneously in class, and then apologise. In yoga class it means you’re doing good yoga, so yawn all you like! In some classes teachers even lead a session of yawning! Im not propsing make you all yawn in class but the next time you feel tense, tired, or think of doing some yoga practice start with a really big yawn.